The Universities and Colleges Union (UCU) has withdrawn from a compromise reached with Universities UK (UUK) yesterday afternoon, calling for strike action to continue for the rest of this week and a further 14 days during the exam period, following backlash from UCU members nationwide. The decision follows widespread discontent with the proposal agreed upon from various branches of the UCU, including that of Cambridge. Representatives from UCU branches across the country met in London today at 11am to convey members’ responses to the proposals to the Higher Education Commission (HEC). This morning, Cambridge UCU convened for an emergency meeting – the largest in the union’s history, one speaker claimed – and voted with a wide margin to reject the national agreement. One member described the current dispute as a turning point: “This is a time to break from the past”, where “it is utterly vital to resist the negotiation now”. The motion to oppose the proposed agreement was brought to the HEC by the vice-president of Cambridge UCU, Dr Sam James, who represented the branch. Academics from dozens of universities have spoken out over the deal’s ‘transitional benefit arrangement’, which revisits the defined benefit cap of £42,000 – among other aspects of the agreement – in three years from April 2019. The UCU has called for further urgent negotiations with the UUK following the withdrawal. In the meantime, strike action will continue for the remainder of this week as the union begins making detailed preparations for 14 additional days of strikes over the assessment and exam period. Universities UK released a statement in response to UCU’s withdrawal from the agreement, calling it “hugely disappointing that students’ education will be further disrupted through continued strike action.” UUK added, “we have engaged extensively with UCU negotiators to find a mutually acceptable way forward. The jointly developed proposal on the table, agreed at ACAS, addresses the priorities that UCU set out. “We have listened to the concerns of university staff and offered to increase employer contributions to ensure that all members would receive meaningful defined benefits. We recognised concerns raised about the valuation and have agreed to convene an independent expert valuation group. The UCU has announced it will no longer attend the Joint Negotiation Committee meeting tomorrow, for which the UUK is now consulting with employers from the Universities Superannuation Scheme (USS), a pensions framework for staff at pre-1992 universities, to produce a revised mandate for discussion following the UCU’s withdrawal of the proposed agreement. The agreement reached yesterday, in negotiations mediated by the conciliation service Acas, bridges certain elements of the existing USS framework and the changes proposed by UUK in January. The agreement retains defined benefit pension schemes for staff at a lower income threshold of £42,000, increases employer and employee contributions 1.3% and 0.7% respectively, and calls for both sides to “engage in meaningful discussions” to explore the possibility of the risk-sharing scheme of Collective Defined Contributions (CDC). Over 9,000 UCU members have signed an open letter rejecting the agreement between UCU and UUK, including more than 140 staff at Cambridge. 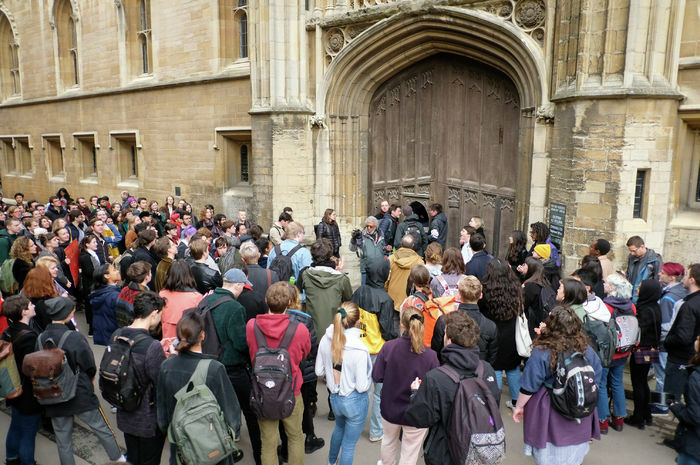 A group of Cambridge students have been occupying Old Schools since yesterday afternoon, in an action described as “in support of staff striking to defend their pensions”. Earlier today, an emergency rally was called which saw an estimated one hundred demonstrators demand free access to the building, and for their to be no repercussions for the occupiers within. The occupation intensified when some demonstrators climbed through the window to join those already inside. It remains to be seen whether the University will agree to meet their demands.